The delegation awoke to more uncharacteristically warm weather – despite it supposedly being winter here in New York, we have been treated to day after day of sunshine and temperatures as high as 18 degrees. After our morning briefing, we headed off towards midtown for our final meeting of the tour. High above Madison Avenue, we met with New Zealand Consular-General and Trade Commissioner for the Eastern USA, Beatrice Faumuina. 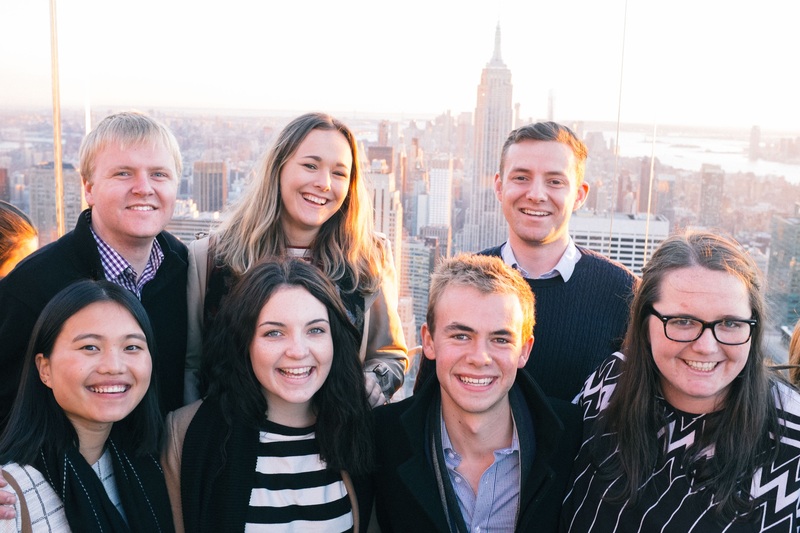 As well as giving us an insight into her work in New York and some of her current projects, Beatrice spoke with us about her journey, some strategies for success and tips for personal and career development. The delegation left the meeting feeling inspired and ready to put what we’d learnt over the past three weeks into action once we get back to New Zealand. Our time with Beatrice was the perfect way to wrap up the meetings portion of the tour! Following our meeting with Beatrice, we had a few hours of free time before our visit to the 9/11 Memorial and Museum. The delegation split off, roaming the shops of Madison and Fifth Avenues to find clothing and footwear bargains. En route to the World Trade Centre a few of us ventured down Wall Street to find the infamous Charging Bull statue and pay the President a visit at Trump Tower. Sadly, President Trump must have been off in Florida for yet another taxpayer funded “break,” as there was no sighting! 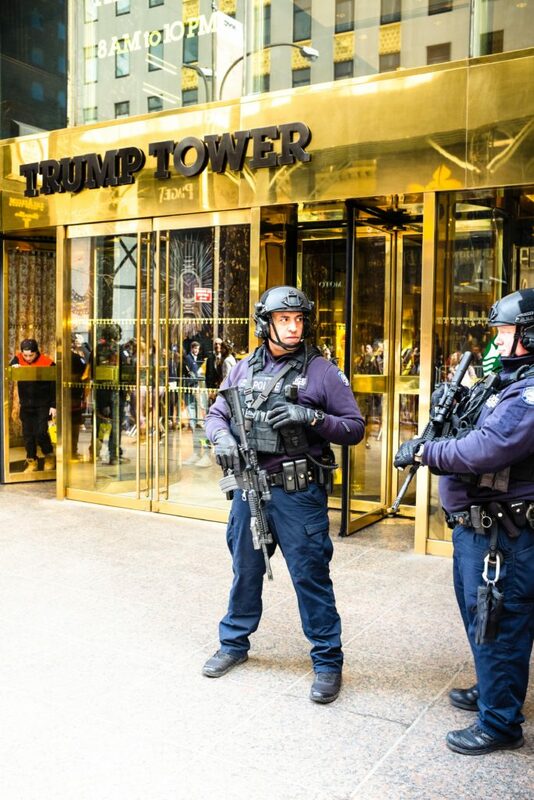 Security was tight at Donald’s home away from home, Trump Tower. After regrouping at the World Trade Centre, we slowly made our way through the National 9/11 Memorial. 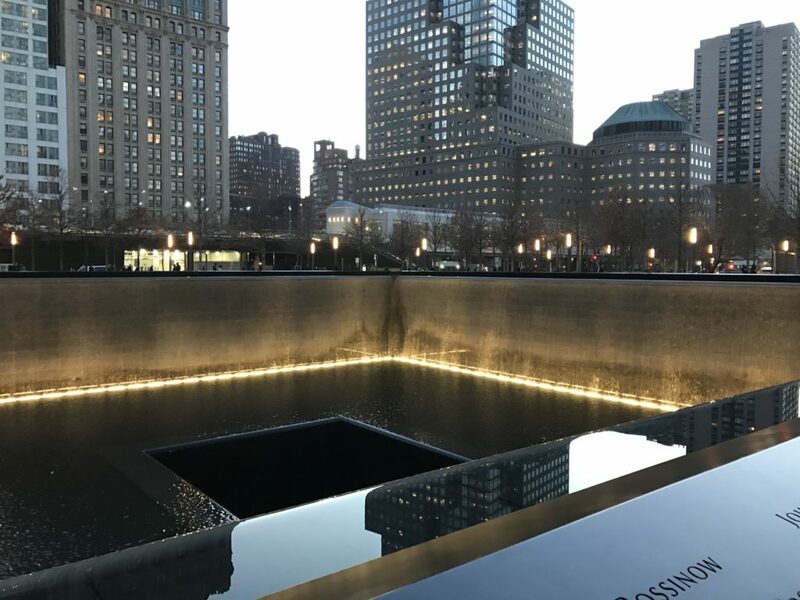 The footprints of the Twin Towers have been turned into two beautiful waterfalls, with the names of the victims inscribed around them. Despite being in the centre of New York the memorial is nearly silent; the only sound is that of the waterfalls. This was a very poignant experience for us, because although many of us were too young to fully remember September the 11th 2001, we definitely felt the repercussions of it for years to come. The National 9/11 Museum sits right next to the Memorial and this was our next stop. Chronologically, the museum details the catastrophe from the plan’s inception, that horrific day and the ongoing aftermath. The exhibits were informative but also very moving – one in particular, which featured stories of the victims, drew a few tears. Our time at the Memorial and Museum reminded us of the importance of the values of the United Nations and of the need to bring cultures and peoples together. 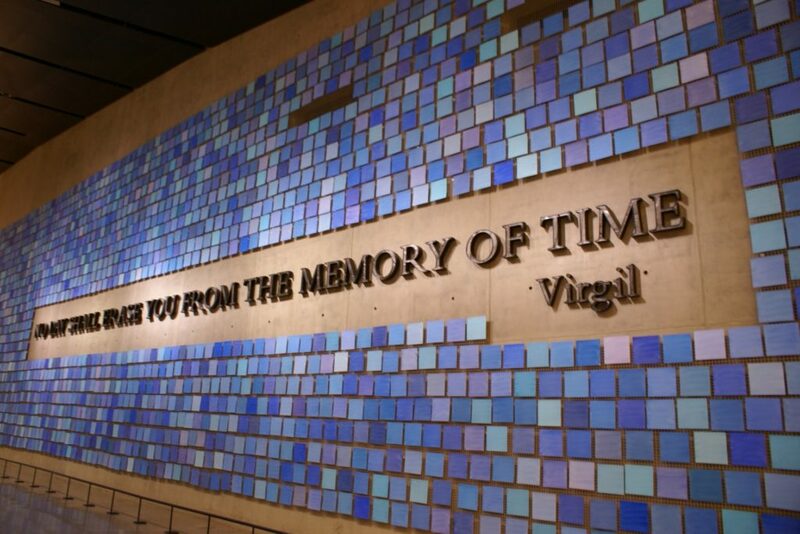 A powerful memory to those who perished on September 11th 2001 at the National 9/11 Museum. Our New York delegation dinner was at 12 Chairs, a boutique Mediterranean restaurant in the heart of the Soho District. We were joined by Ben Schaare, who we had met at the UN the day before. Over a huge spread of Mediterranean cuisine, we reflected on our experiences from the day and made plans for our upcoming free time. Our bellies full, we headed back to the hostel for a good night’s sleep before we were let loose on the Big Apple! In amongst the hustle and bustle of New York, the memorial is a poignant reminder to what happened that fateful day. We woke up to another unusually sunny and warm February day in New York, and began our day on the Upper West Side with a Q&A with Glenn Denning. Glenn is the Director of the Master of Public Administration in Development Practice programme within Columbia’s School of International and Public Affairs (SIPA). He is also an expert on agriculture and food systems, although his work has shifted to a sustainable development focus. We discussed the Green Revolution in Asia, technological developments in food production and the steps required to feed the growing population sustainably (intensify production strategically, improve distribution of food, cut food waste and change diets). The meeting brought a fresh and expert perspective on food production and security, and gave the delegation an idea of the potential options for postgraduate studies at SIPA. The delegation with Glenn Denning. 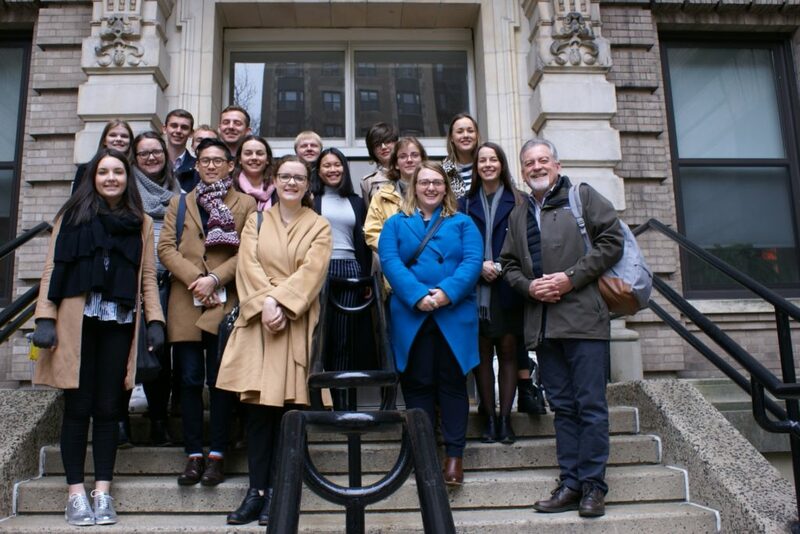 Following our meeting with Glenn, we walked to the central part of the Columbia campus to go on a tour with two Fulbright Scholars, Alex Sinclair and Jeremy Olds. 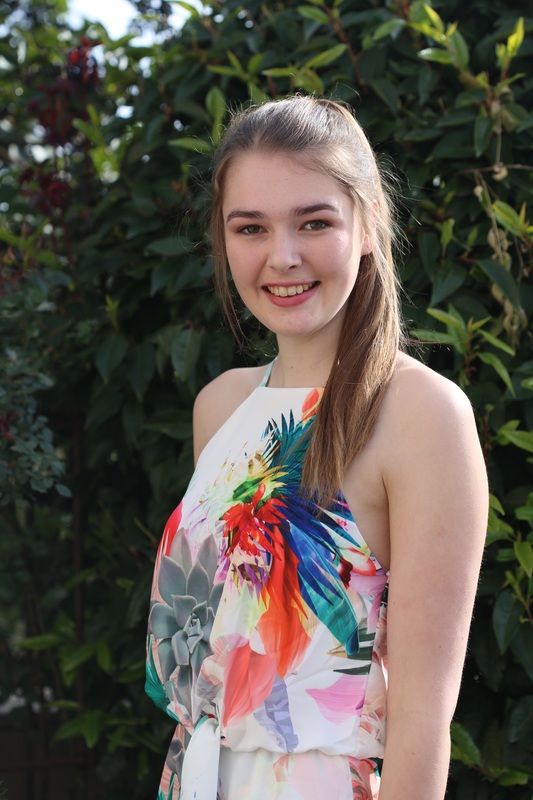 Alex, who is working towards her Master of Laws at Columbia, talked about the international perspective she has gained from studying in the US, such as the value of NZ’s administrative legal arrangements after studying the legal effects of the US Constitution. Jeremy, who is pursuing a Master of Arts in Journalism at the School of Journalism (one of the best in the world), shared his excitement about learning from and alongside the finest editorial and writing staff in the world, and emphasised the importance of good journalism in our time. Alex and Jeremy also gave valuable advice about overseas postgraduate studies, scholarships and adapting to learning in a foreign environment. One of the most interesting things the delegation heard was their observations of the Columbia University and New York communities’ reactions to last year’s election result. It was encouraging to see Kiwis in such great places. View of one of the statues in the courtyard outside Columbia Law School. 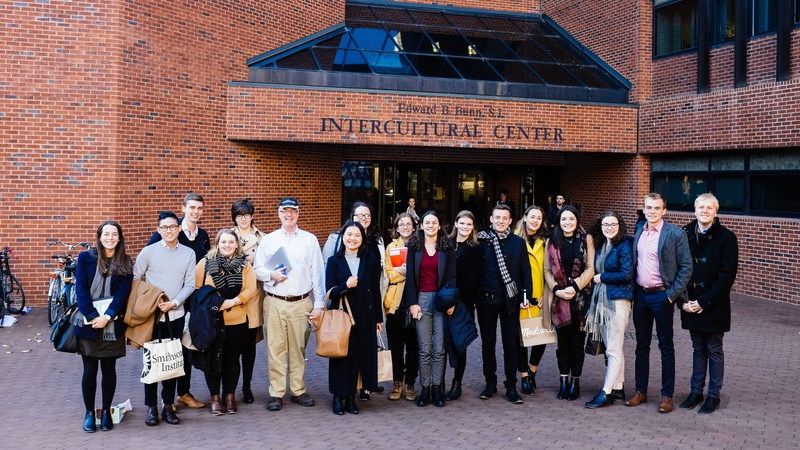 After the tour of Columbia, we grabbed $4 street food and headed downtown, back to the UN Headquarters for the third day in a row, but this time, we were going into the Secretariat building – the staff only part! There, we spoke to Ben Schaare, a Kiwi working in the UN Department of Economic and Social Affairs. Ben graduated from university and took himself to various roles and postgraduate study overseas. His current work involves promoting the Sustainable Development Goals through famous people such as Lionel Messi, Jack Ma and Shakira. 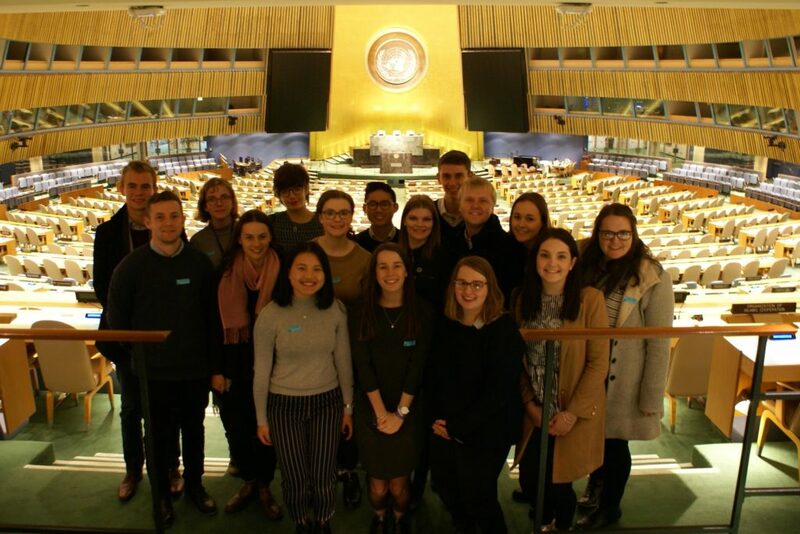 From Ben’s experience, we realised again the importance of having international experience and networking to get your foot in the door at the UN. The career development theme continued when Hector Sharp and Scott Colvin, UN legal interns, joined us. Touching on how many members of our delegation hope to work in the UN or in some international law capacity, we were given grounded, useful advice about getting ahead in the UN. We topped off the day with an official UN Headquarters Tour, during which we visited the beautiful Security Council, Economic and Social Council, and General Assembly rooms. The delegation in the General Assembly at the UN Headquarters – unfortunately the lighting was terrible for photos, which do not do the place justice! After meeting with the New Zealand Permanent Mission, we headed back to the United Nations – our second home in New York. For the third time in even less days, we had the pleasure of being briefed by yet another individual with seemingly endless experience and knowledge. Fanny Schaus, an employee of the Office of the Legal Counsel, explained in great depth the integral functions of the Office of Legal Affairs (OLA). Particularly intriguing were discussions of privileges and immunity awarded to UN staff, and how much work is dedicated to preserving these so that the organisation can operate independently. The lawyers in the delegation were excited to learn about all 6 divisions of OLA, including the General Legal Division, Codification Division, and Treaty Section, amongst others. Perhaps the most exciting takeaway from this meeting was insight into the Young Professional Programme (YPP), the process of examination for admission as a UN employee. This exam has been up to 8 hours in the past, and includes questions on all areas of applicable law, from Contract to International Trade and everything in between. After learning about this gruelling process, it was clear we had the fortune of being briefed by an incredibly talented, intelligent and accomplished woman. Posing outside the UN Headquarters on the banks of the East River. 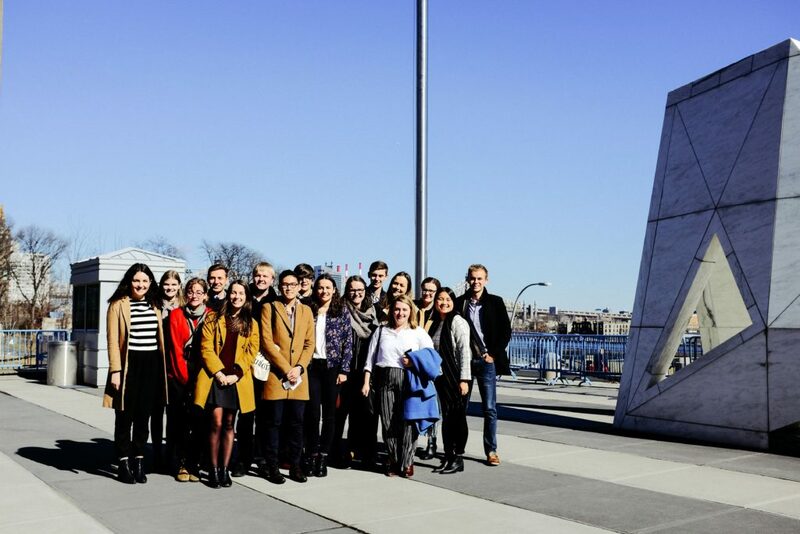 After a quick break for an afternoon snack, and a coffee to calm the nerves – we headed over to the UN Development Programme building and were excitedly ushered upstairs to the 21st and final floor. 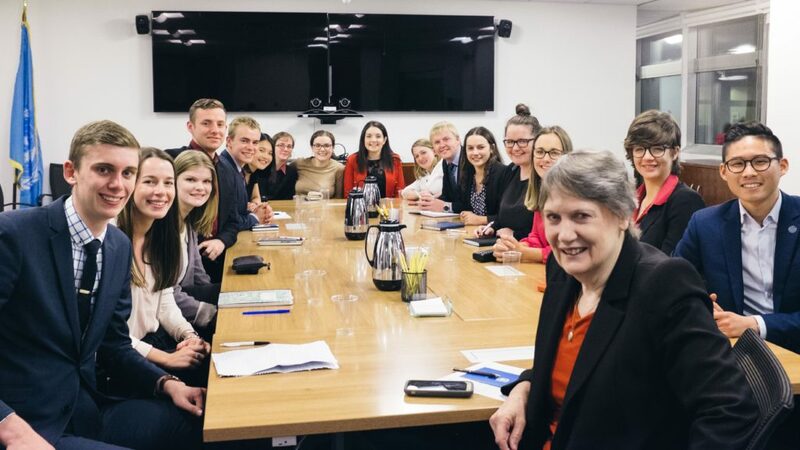 Positioned around a dauntingly large boardroom table, we all primped and preened ourselves while we waited for Helen Clark to arrive. The room filled quickly with anticipatory whispers of excitement, and last minute peer-vetting of questions. Eventually Helen joined us and almost simultaneously calmed our nerves. She spoke assertively and decidedly about her time as Administrator of the UNDP, and the progress she had seen. Particularly present in her discussion was how the mandate of building a long-term stable society could be applied to conflict zones, who overwhelmingly bear the burden of humanitarian crises like famine. Helen highlighted how the practical success of the UNDP relied on building a foundation of resilience in these susceptible countries, “so that when conflict ends, they will be in a better position to help recover the country”. Coupled with a reflection on her admirable work, we were also offered tidbits of life advice and tips for future success – more than a few of us left eager to read Nelson Mandalas “Long Walk to Freedom”. As it approached 7pm, we thanked Helen for being so kind as to take time out of her unimaginably demanding schedule to see us. Echoing her sentiments of earlier in the day regarding social media as an invaluable tool for youth engagement, Helen featured us on her Snapchat – adding a filter, geo-tag and all! With Helen Clark at the UNDP!! The afternoon of Tuesday the 21st felt like a nerdy dream. 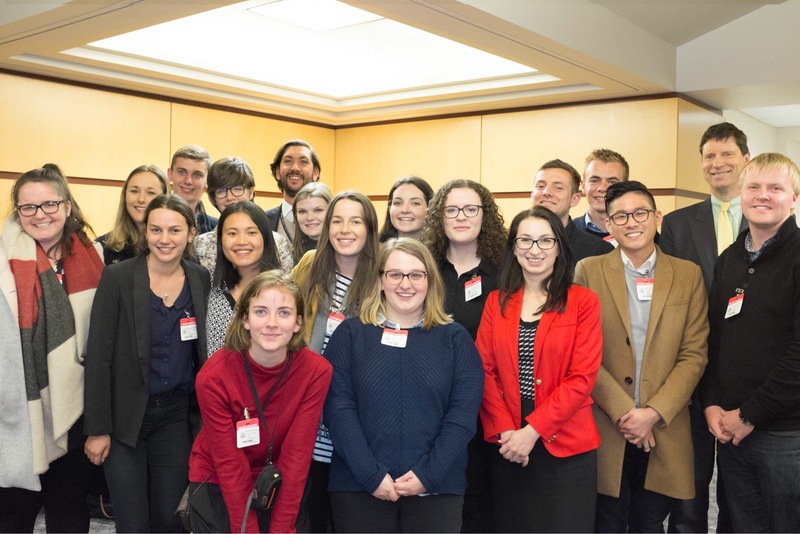 Our eyes were opened to an entirely new path for a legal career, one combining the endearing flexibility of international law, and the opportunity to make a tangible difference in the world. Helen Clark exceeded expectations: she was eloquent, perfectly humorous, realistic, and inspiring. New Zealand should be proud to have such an honourable woman representing them on the world stage – and perhaps with her advice, one of us might sit in that same chair in a few years time! Arriving in New York by train, we were treated to a magnificent view of the iconic buildings which define the city; the Chrysler Building, Rockefeller Centre and Empire State Building. However, it was not until our first meeting the next day that we began to fully comprehend the enormity of the city or it’s character. 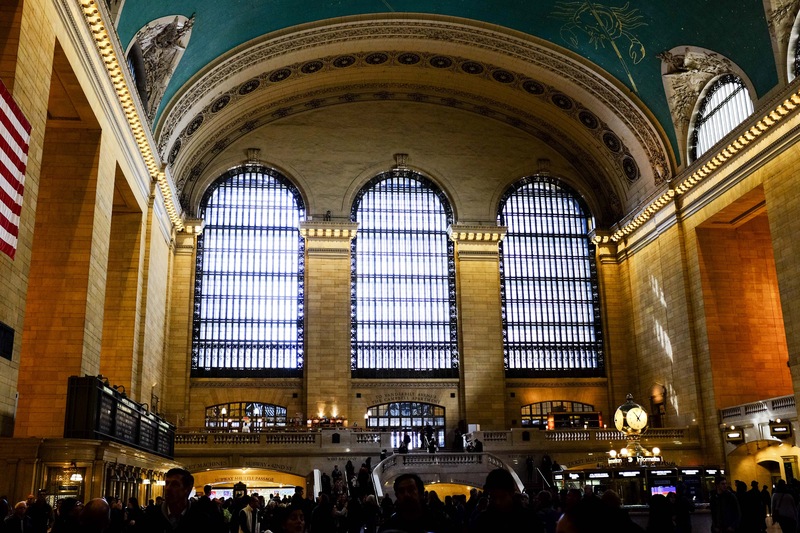 Navigating the hustle and bustle of the infamous subway system, we soon found ourselves standing in the centre of the beautiful Grand Central Station. Nestled between the skyscrapers which dominate the New York skyline, it is an imposing figure and the central hub of the city; over 750,000 people pass through the station daily! Passing through Grand Central Station. Just a few blocks away, along the Eastern side of the Hudson River, we gathered outside the United Nations Headquarters. Our first meeting with Ari Gaitanis, offered great insight not only into UN peacekeeping missions around the world, but how students like us could one day contribute to their work. Speaking of his experiences during times of conflict in places like Sudan, Lebanon, Afghanistan and Thailand, he emphasised how important the work of the UN was and the impact it had on people’s lives; ‘’ultimately the goal of a peacekeeper should be to be out of a job’’. Later we met with Martina Donlon, who shared her knowledge about human rights, one of the core tenets on which the UN was founded. She echoed similar sentiments but warned that the is just what member-states agree to. After a lengthy stay at the UN gift shop, we soon headed off to the Top of the Rock and as the Sun set, an incredible view of the city. Timing our visit perfectly, we enjoyed both the golden glow of the skyscrapers as dusk set, and the twinkling lights of the city that never sleeps. Perfect evening to be at Top of the Rock! 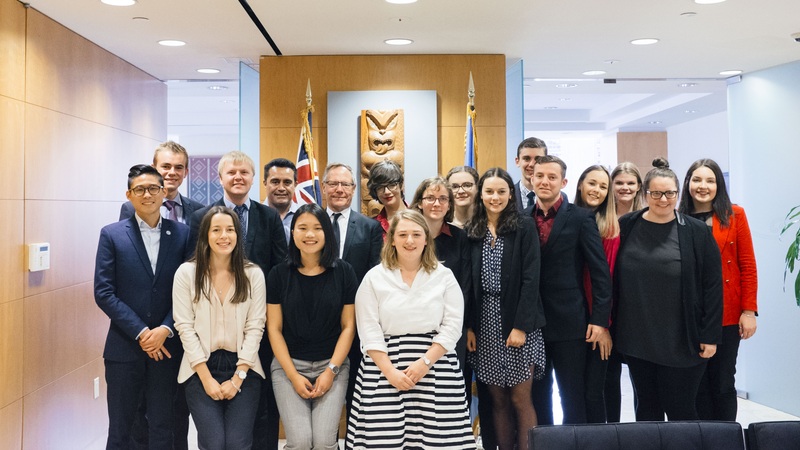 Furthering our understanding of how the UN operates, the next morning we met with New Zealand’s Permanent Representative to the UN, Gerard van Bohemen, and his deputy Phillip Taula. There, we benefited from learning more about New Zealand’s term on the Security Council, the campaign which got us there and the lasting impact our two year term would have on the international community. They highlighted our contributions: Security Council reform and introducing more equitable guidelines; building stronger relationships with other ambassadors and those within the UN; raising the platform of small island, still developing states; and, our role in brokering resolution on Israeli settlements. When asked about the challenges of realising such goals and the recent backlash from Israel, Gerard encouraged us to be ‘’bold and brave’’ in our approach, to always ask the ‘why’ questions and to stand true to New Zealand values. A powerful message as we continue our education and learn more about how the UN operates. The delegation with Gerard van Bohemen, NZ Permanent Representative to the UN, and Phillip Taula, Deputy Permanent Representative. 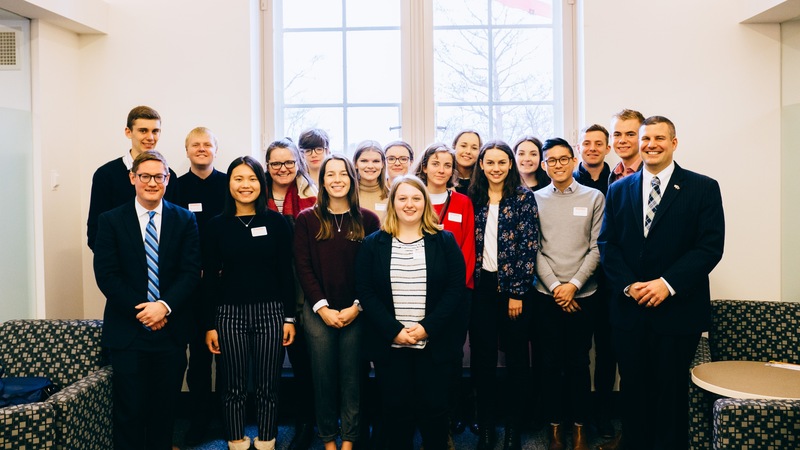 Harvard National Model United Nations (HNMUN) was four days of intense debate, challenging negotiation and gruelling hours – much like the real United Nations. After all, it started only 10 years after the United Nations itself. This year was its 63rd session, which involved 3,000 university students from all around the world, gathering to find solutions to some of the world’s most difficult issues. We, the New Zealand Universities’ Delegation, was assigned to represent India in various committees. Outside of those committees, four delegates applied successfully to Specialized Agencies, which meant that they represented other entities. Each delegate participated in six committee sessions, along with various evening activities: a club night, international bazaar and cocktail hour, and delegate dance. The packed schedule was a shock to those of us who were used to conferences at home – there is much, much less sleep allowed in Boston! Our delegation held their own in committee sessions and did our universities and New Zealand proud. Madison Hughes, our Head Delegate, was awarded Best Delegate from the Non-governmental Organisation Programme; Gianina Schwanecke was awarded an Honourable Recommendation for her work as Der Spiegel as part of the Press Corps; and Ella Brownlie was also given a Verbal Commendation for her work as Al Quds Al-Arabi in the Press Corps. These are outstanding achievements and the emotional celebrations of all the delegations that won awards at Closing Ceremonies was an experience in itself. Below are individual accounts of the conference from each committee. We were assigned to the Legal Committee of the General Assembly, and thoroughly enjoyed our time at Harvard National Model United Nations. The first order of business was setting the agenda – we were pleased when the topic of Amnesty in Conflict Torn States was selected. Through informal negotiations in the hallways and lobby, we quickly found states who shared our perspective and goals and began forming into a bloc. Splitting our time between making speeches to the committee and lobbying outside, we managed to be a part of the coalition of nations that began formulating a draft resolution on the topic. Once the draft was written, our focus shifted to convincing other states to sign on to our proposal and not the many others that had been drawn up. We were pleased that throughout the negotiation process we managed to keep the majority of the clauses we proposed in the resolution, while still managing to work collaboratively and craft the resolution into one that was favourable to many states. We managed to gather enough support for our resolution that it was one of the three that went to the final vote. Our resolution was unique in that it was only 3 pages long, a pleasant contrast to the up to 17 page US style ones! After a tense vote, our resolution was passed by the committee – an achievement that we were very proud of. The Legal Committee was filled with a diverse range of students from all across the world. Our first night of outside lobbying saw us meet Canadians representing Brazil, Indians representing Thailand, Venezuelans representing France and Peruvians representing Portugal. After correcting almost everyone’s assumptions that we were not in fact Australian, we were always met with a long list of questions and compliments for our country. By the end of the conference the legal committee was well and truly bonded, with friendships cemented through all forms of social media accounts. 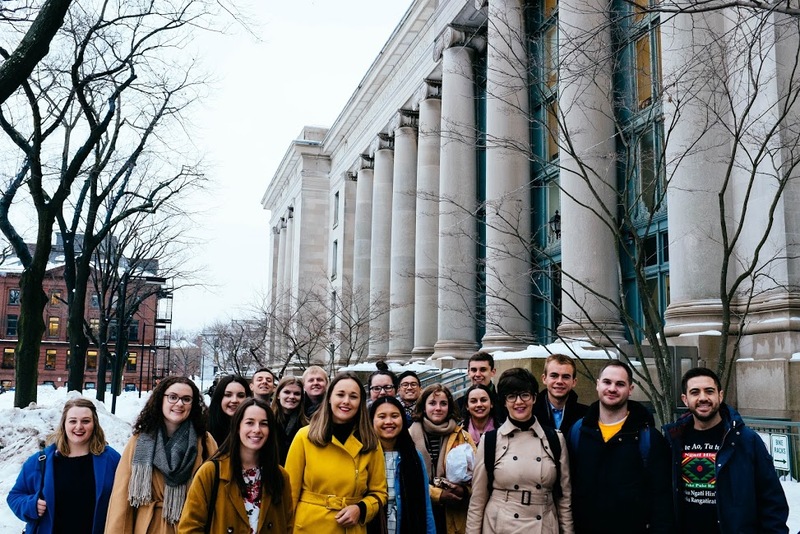 Our time at Harvard National Model United Nations overall was an incredibly eventful and full on four days, with our brains and bodies being tested to come up with solutions together to help our world keep spinning. Our experience with the Legal Committee particularly was eye opening and educational, and it was exciting to be able to put what we had learnt in law school thus far into resolutions. We leave HNMUN with a desire to always think critically and creatively to solve problems, with a renewed sense of the importance of being global citizens, and with a whole new set of friends from all across the world who made our experience the great time that it was. 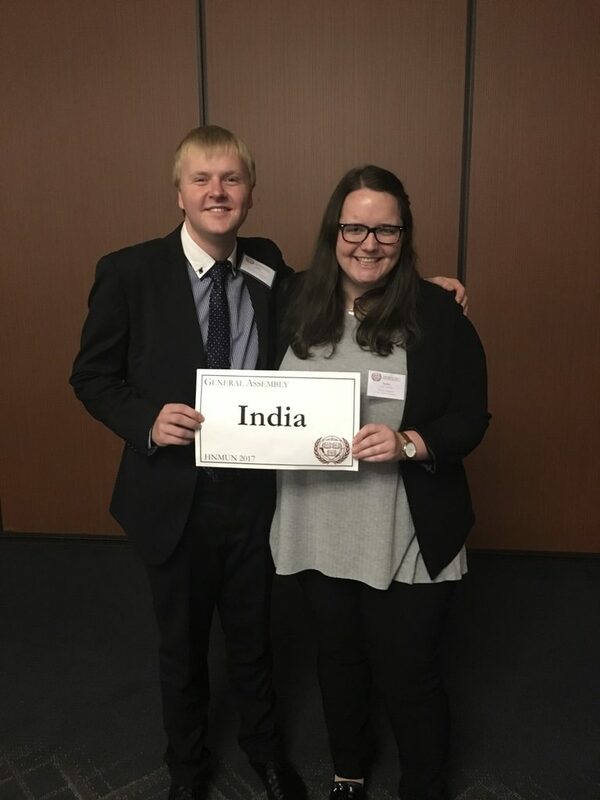 Emily and Jayden, delegates for India in the Legal Committee at HNMUN. HNMUN was an amazing experience. As delegates of the United Nations Environment Programme (UNEP), we set out to achieve a great resolution which would reflect India’s position as a developing nation that is very susceptible to the effects of climate change. In the first committee session, we found ourselves thrust into a world of highly technical and scientific knowledge, which we navigated as best we could, learning more as the debate continued. The first discussion topic was selected was the viability of Geoengineering as a response to climate change, a topic which required familiarity with concepts such as solar radiation management, photophoresis and carbon sequestration. After forming a coalition with several other developing nations, we were able to work together to draft a working paper. By morning the next day, the working paper (produced overnight) had up to 51 clauses and ten pages. We learnt some great diplomacy lessons when lobbying other nations to support our resolution (the United Kingdom delegate proved hard to convince). After warming up to the intensity of the conference, we both took the opportunity to voice India’s desire to place a moratorium on the use of geoengineering technology, until further research could be conducted. By Sunday we had successfully passed our bloc’s resolution, calling for the creation of an International Agency for Climate Engineering (ACE). After reading more acronyms than our brains could compute, we left HNMUN having made wonderful global friends, stepped outside our comfort zones, and truly appreciative of the opportunity. I walk into the Special Summit on Sustainable Development and stand, uncertainly in the door way. The room is an absolute hive of activity as people hastily introduce themselves, make their personal pitch and note who is delegate to which country. I barely have time to scan the scene before a hand shake, a smile and a name are offered to me. Reflecting the tone of the committee, that remained throughout the weekend, one of inclusion and constantly meeting new people. Our first session decides which topic we will commit our time to; “Development After Health Crises”. Some areas of focus included what role organisations such as the UN can play, as well as how we can go beyond responding to pandemics on a one-by-one basis, to looking at creating sustainable development. The enthusiasm and engagement of the committee was incredible, as was its diversity. I was able to meet people from the U.K, Canada, Europe, South America, Pakistan, Ghana, Kenya, China, all over the USA…! These delegates each brought with them unique insights both into their home countries, and the states that they were representing. Over four days, we debated ideological points of contention, as well as logistical practicalities of possible tangible actions. Undoubtedly, however, the most significant takeaway was not our conclusions on this issue. I learnt a lot from the people I became close with during the conference. I appreciate that although we brought with us very different backgrounds, we came to HNMUN with common interests and a shared desire to make a difference. Understandably, it’s easy to dismiss discussion of asteroid-related disasters as scaremongering paranoia. Doomsday propaganda, even. Yet the UNCOPUOS at this year’s Harvard National Model United Nations conference was tasked with authoring a resolution in regards to such a threat. And, indeed, finding a balance between the pragmatic and the paranoid proved to be a challenge. An acceptable resolution needed to address the detection of asteroids, methods of destruction or deflection, and emergency responses to a strike. As India, our double-delegation was in the unique position of representing a country that was both economically developing, while simultaneously boasting an advanced national space programme and often-contentious nuclear weapons capabilities. These factors made India an important player in the Committee, which after several days of intense debate, negotiation and lobbying managed to whittle down ideas to produce two draft resolutions pertaining to dealing with asteroid-related disasters. The threat posed by asteroid-related disasters saw the formation of interstate alliances which served to breach traditional geopolitical boundaries. India found itself in support of a Draft Resolution that included the United States, the Russian Federation and China – a dynamic that allowed for interesting and competitive debate within the UNCOPUOS Committee. The committee also presented delegates with a series of crises, ranging from Donald Trump’s press releases to the detection of an asteroid likely bound for Earth. During the final committee session, the UNCOPUOS adopted the comprehensive, 25-page resolution to which India was a signatory. At this year’s Harvard National Model United Nations I was lucky enough to be part of the ECOSOC (Economic and Social Council) World Intellectual Property Organisation (WIPO). This involved intense debate balancing the need for protection for intellectual property rights and the humanitarian consequences of overreaching protections. Under WIPO member states negotiate the protection of intellectual property with the goal that protected intellectual property will continue to spurn future innovation and development. The two topics of this particular committee were that of Corporate Espionage and Pharmaceuticals; both extremely engaging and important areas that are remain important in the 21st century. The committee began with moderated caucus debate in order to determine which one of the topics would be covered over the following days. After much debate and negotiation the committee voted in favour of covering the topic of Pharmaceuticals for HNMUN WIPO 2017. This signalled the next stage of the committee: working papers that eventually form draft and then final resolutions. Late through the night several blocs worked on forming comprehensive policies to tackle the problems associated with intellectual property and Pharmaceuticals – namely striking the balance between intellectual property rights and costs, and access to affordable medication especially for those in the developing world. Solutions proposed and debated were innovative and expansive, ranging from a system in which companies can buy shares in the development of a drug to reduce risk and upfront R&D costs to recommendations for protection of cultural and indigenous medicinal practices. Throughout the conference various countries lobbied others to join their blocs and help shape the resolution, for example India working with traditional allies Brazil and South Africa under the BRICS informal alliance. 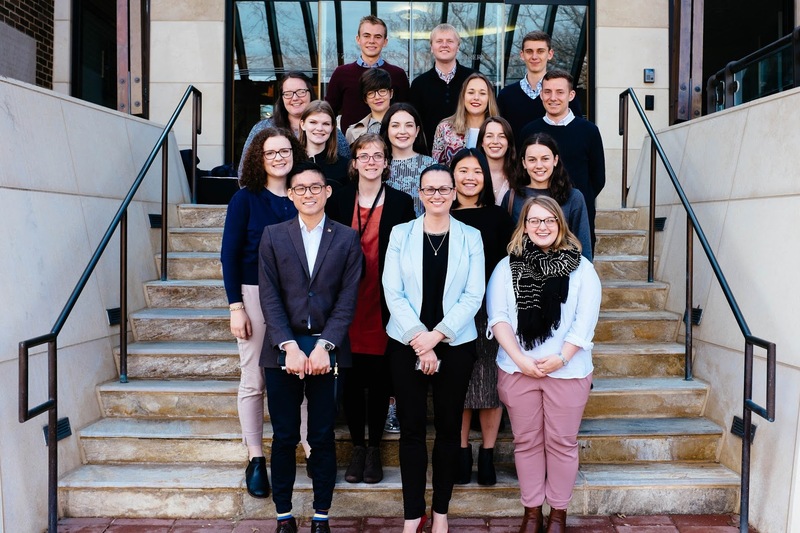 After days of debate, lobbying and writing, six working papers eventually were condensed to three draft resolutions, and the committee was able to vote on the resolution they best thought tackled the issues at hand. However due to a split in the blocs neither of the three drafts were able to reach the 2/3rds majority needed to pass – resulting in an intense evening of further lobbying and negotiations. Finally the committee was able to come to a consensus and balance the views of the developing and developed nations, passing the merged resolution on the final day. Overall, the HNMUN was one of the most intense and rewarding educational experiences I’ve been part of. The committee itself allowed me to understand areas of policy and law that I had never come across before and even had me considering other subjects in which my knowledge severely lacks (such as macro economics!).. The high level of debate, coupled with passionate delegates, lead to me to an unparalleled experience and I look forward to taking what I have learnt and putting it back into both my university studies and volunteer roles for years to come. Being on the Commission on the Status of Women, an ECOSOC committee, was an eye-opening experience and a full-on three days. I was very excited to be on a committee discussing the rights of women, a cause that I am passionate about. In the commission, I was representing India. In preparation for the conference I had to research India’s positions on two topics, one of which we would end up discussing; they were: Gender Inequality in the Workplace (Topic A) and Violence Against Women (Topic B). It was interesting having to represent India. The country’s positions on certain issues facing women are quite different from my personal views, and I thought it might be difficult having to defend these positions but I found that in the process of research I could see where some people might have developed their positions. The first thing our committee did was to start debating which topic we would spend the conference discussing. We ended up discussing Topic B, Violence Against Women. Working with a bloc of China, Russia, Syria, Bangladesh, and others, we were able to develop a comprehensive working paper that was true to India’s interests. Our bloc later merged our resolution into a resolution with Spain, UK, and Switzerland. In the end, we had two resolutions to vote on and we finished the conference by passing both! In 1944, the World had just been through the great depression, and the Allies were nearing victory in their World War II campaign. Delegates from 44 countries came to discuss how the international economic infrastructure would mitigate further recessions, and prevent the economic animosity that engendered the bitterest of all human conflicts. The goal was to create institutions that would encourage collaboration, cooperation and cohesion as the world resurfaced from the ashes of the devastating conflict. Our committee was presented with this behemoth of a task, instructed to be the architects of international finance for decades to come. The challenge was eagerly accepted by all those in attendance. The enthusiasm and engagement in the room was palpable as each delegate presented their interpretation of the events and the solution through the lens of their country. In this committee, I represented India, on the cusp of gaining independence from the British, seeking to establish a world of opportunity for it to maximise its development prospects. Intense negotiations ensued, as working papers turned into draft resolutions. Mergers were necessary to collect votes, and create more robust solutions to the problem. The last committee session ultimately culminated in a tense, close fought debate between two blocs. Fortunately, the resolution I sponsored passed by one vote in a tense final voting session. Overall, the whole conference an enlightening experience from people struggling to understand my accent, to hearing about the lives of other delegates home countries, to trying to design the international economic system from scratch. The conference was very rewarding and will be fondly remembered. I spent my four days at the Harvard National Model United Nations as Dr Nur al-Din Tarraf, Deputy Prime Minister for Justice the United Arab Republic. It was February 2nd, 1958, and Nasser’s Egypt had just united with Syria. Ours was a specialised agency with a strong crisis dynamic, a different angle to Model UN than the committees I was used to. Rather than writing and debating resolutions as existing UN member states, thirteen of us were plunged backwards in time to see if we could make a short-lived historical union work. I was new to how crisis committees work in the United States, so it took me a while to use my crisis powers to my minister’s full ability. Writing covert notes to characters fictional or real, every member of Nasser’s cabinet plotted to advance their own power and undermine the rest of the cabinet. Often, these plots were to destroy the very UAR we were given the task of governing. I chose a different tack at first, attempting to make the country work. I wrote to my counterpart in Syria for advice on re-invigorating our now common justice system and sought peaceful reconciliation with the unfriendly Arab Federation. What I loved about my specialised agency was the pace of the plot. Every day became a new year, and at shorter and shorter intervals we would receive crisis updates moving the plot forward. At various points King Hussein of Jordan expressed his wish to join our pan-Arab union, the Ambassador to the United States was mock assassinated before our eyes, and the USSR was offering us 100 Billion USD in exchange for a right to build a military base by the Suez Canal. That a committee had a narrative was a completely new part of MUN for me, and I appreciated that it was driven by the delegates themselves. Crisis updates were responsive not only to the plotting of individual ministers, but to the directives we debated, voted on, and passed as a whole. We were confronted with the consequences of our decisions: often unpredictable, sometimes counterproductive, but always delightfully clever. At the conference I was lucky enough to be a member of the Non-governmental Organisation Programme as a representative of Greenpeace International. What this meant was that unlike other delegates who were assigned to particular committees, I was free to roam around whichever committees I desired. This allowed me to offer Greenpeace’s perspective on a wide variety of issues. Most of my time was spent in the UN Environment Programme, however, as this committee was the most relevant to Greenpeace’s cause and thus called for the most input. In this committee, I pushed for campaigns to change consumer behaviour while discussing the topic of climate change and geoengineering and advocated for a global shift toward veganism when discussing the future of fisheries, a perspective which was surprisingly well-received. Ultimately, being part of the NGO programme was an incredibly fulfilling experience. In particular, I found other delegates to be very receptive of NGOs. I was overwhelmed by the number of delegates who sought my endorsement of their proposals as a selling-point when pitching their ideas to others. It seemed that Greenpeace’s seal of approval on a proposed solution was a very valuable negotiation tool. Further, this experience really taught me the value of NGOs in the international arena. This year’s Harvard National Model UN conference was an unparalleled experience which has taught me as much about myself as it has about the art of international diplomacy and negotiating. Engaging in a conference which boasted some 3,000 students – many the brightest young leaders from around the world – challenged me to rethink my capabilities. In the lead up to the conference, researching Der Spiegel allowed me to put into practice the media analysis skills I had learnt throughout my years at Victoria University. Learning to write through the prescribed lens of my assigned newspaper allowed me to rethink my own biases and offered me first hand experience of life in the journalistic field. 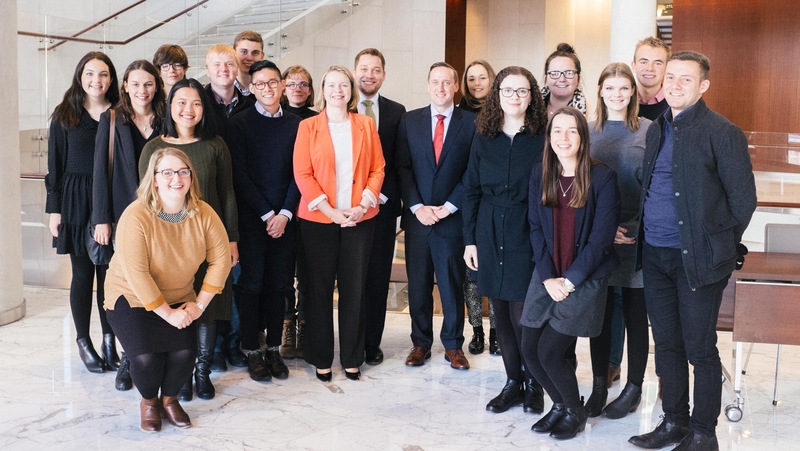 From working to tight deadlines, announcing press releases, posting to social media, to conducting interviews and press conferences, life in the Press Corps was as dynamic as it was rewarding. Finishing pieces which helped shift the dialogue of the debate, or which provided other delegates insight into different topics, made our work tangible. My Press Corps credentials allowed me to wander freely around the conference and engage with delegates in a number of committees. I greatly value the insight this experience gave me and the friendships I made along the way. Earning an Honourable Recommendation for my writing was a terrific way to end the conference and an even more exhilarating way to kick off my final year of Media and Development Studies. At Harvard National Model United Nations, I was in the Press Corps, a committee in charge of reporting on the conference and committee negotiations via social media, and publishing articles on the website. I represented a newspaper called Al Quds Al Arabi, which is an independent pan-Arab newspaper, based in London. Each member of the Press Corps was assigned to a specific committee and had the responsibility for reporting on the activities of that committee. I was assigned to report on the Historical General Assembly for 1991, which was discussing the decolonization of Western Sahara. As the press corps we were fortunate enough to be able to have a slightly broader view of the conference, as we were also able to visit other committees to write opinions or expository pieces on different policies and initiatives that delegates were pursuing. It was really interesting as well to think about how to best represent the views of a paper with different political opinions to my own. Another incredible takeaway from being in Press Corps was running press conferences. This was a great opportunity to experience the reality of being a journalist, asking questions of the delegates about their proposed policies – and in turn to witness first hand the power of the press to hold our democratic institutions to account. After falling in love with the wondrous Washington DC, it was time to depart and take a short flight to beautiful snowy Boston! We were greeted at 1am in the morning by a staff member at Hostelling International, who affectionately dubbed Boston one of America’s most underrated cities. He’s dead right – the city is one of America’s oldest, and is the site of many significant events in the American Revolution. Braving the snowy winter streets of Boston. In between completing some final research for our upcoming conference, we squeezed in a tour of the historic Harvard University campus. We jumped in our Ubers over to Cambridge, the township which houses the prestigious University. First stop was the world-famous Coop store, which stocks racks of Harvard-branded memorabilia and specially-selected books. Finally free from the restrictive weight limits of United Airlines, the delegation spent up large on Harvard jerseys, pens, caps and books. After a two hour- long shopping spree, we were greeted by David Green and Mataroria Lyndon (along with his partner Dickson). David and Mataroria are two of New Zealand’s great minds who are studying a Master of Laws and Master of Public Health respectively. The three Kiwis treated us to a tour of the campus, which took us to various historic buildings and monuments. Particularly notable (especially for the delegation’s many law students) was the grand law library. In the library David talked to us about the recent student protests which led to removal of Harvard Law School’s official seal. The former seal bears the crest of Isaac Royall, a notorious slave owner whose endowment of land helped to establish the School. With Fulbright Scholars David and Mataroria outside the Harvard Law Library. Our tour finished with a korero with David and Mataroria about life at Harvard and the journeys that got them to where they are today. It was a privilege to hear their personal stories and their experience in applying to become Fulbright scholars. One learning from our discussion was the importance of being able to articulate our personal stories and how their shape who we are today. The delegation left the meeting feeling inspired and filled with potential for what our own futures might look like. We ended the day with a delegation dinner and an early night before HNMUN Day 1! Our last day in Washington DC was a fitting conclusion to a wonderful week. Our first meeting of the day was with the International Trade Administration (ITA). This is an agency under the United States Department of Commerce that promotes exports of US nonagricultural goods and services. The Administration endeavours to enhances the competitiveness of US exports, promote trade and investment, and ensure fair trade through rigorous enforcement of trade laws and agreements. At the Administration, we met Seth Isenberg, Senior International Investment Specialist for SelectUSA, and Adrian Stover, International Trade Specialist covering the Philippines, Australia and New Zealand. During our discussion, they talked about how they helped New Zealand businesses get a foothold in the USA through Select USA and garner a greater appreciation of the manoeuvring required to optimise business success in the United States. This was a particularly interesting discussion topic in the wake of a unique new administration and an uncertain international trade environment. The delegation at the International Trade Administration. Here, we got an intimate window into the land’s highest office, the Presidency. Presidents have such an influence of the trajectory on the behemothic nation, and consequently the political, economical and social landscape of the world. The weight of the world can rest upon their shoulders. Having an insight into their lives, backgrounds and battles was enlightening and made us appreciate the scale of such a job. Before going to our next meeting, we made a quick stop at the nation’s oldest federal cultural institution, the Library of Congress, the largest library in the world. It is home to millions of books, recordings, photographs, newspapers, maps and manuscripts. 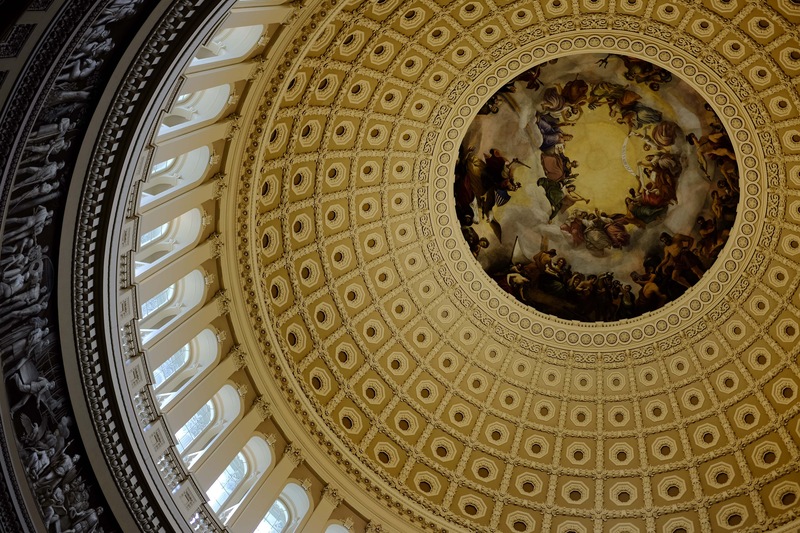 It is the main research arm of the U.S. Congress, and the de facto national library of the United States. Our final meeting in DC was with the House Foreign Affairs Subcommittee on Europe, Eurasia and Emerging Threats. Here, we met Philip Bednarczyk, a Democratic Staffer. We also met Scott Cullinane, a Republican Staffer. They discussed the mechanics of Congress, how they got into their current careers, and the current political climate in Washington. 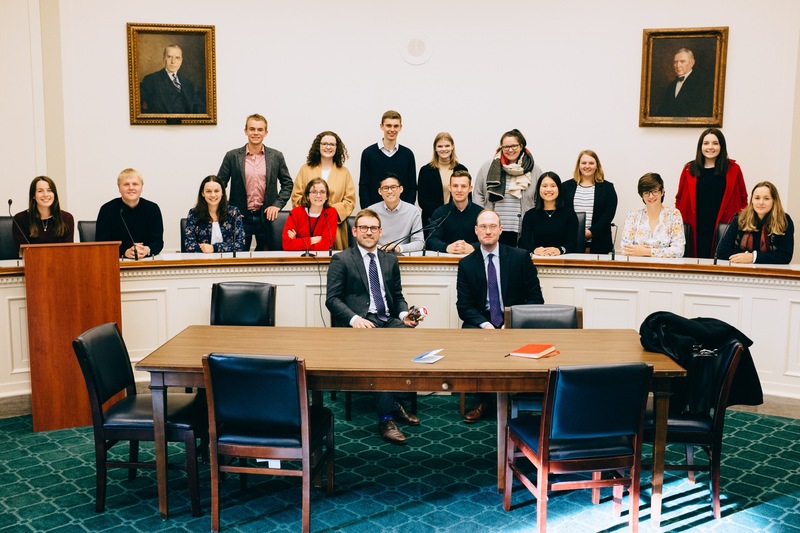 Perceiving these politically turbulent times through the lens of the staff on the ground was both refreshing and intriguing, deepening our perspective of the front lines of DC. It was a highlight for all of the delegation. Overall, it was a much tamer Democrat-Republican discussion than what we’ve been accustomed to with the 2016 presidential debates. The delegation at the House Foreign Affairs Committee. Just before it closed, we also went to the National Archives. The Archives house the the three main formative documents of the United States: the Declaration of Independence, the Constitution, and the Bill of Rights. It was interesting to see the first constitutional steps that America made, in its journey to becoming an international superpower. Despite them being signed over two hundred years ago, they still play a key role today. To be in their presence was humbling. We had one last glimpse of the Capitol, saying goodbye to the political heart of the United States, on our way to the airport. We left to embark for the next exciting chapter of the tour, Boston. Sunday gave the delegation our first full day off in D.C. After a few days of being in the city and seeing the sights it had to offer, we all had plans sorted for the day by breakfast time. Pleasantly surprised by the weather D.C. put on for us, the delegation split ways. Many headed to the various Smithsonian Museums on offer – The Air and Space Museum, The American History Museum, The National Museum of the American Indian, The National Gallery of Art, and one delegate and co-director were lucky enough to get entry into the new and renowned National Museum of African American History and Culture. Another delegate went to the National Zoo, some to the Library of Congress and National Archives, and others to the United States Holocaust Memorial Museum. Photo of two Native American women displayed in the National Museum of the American Indian. Every museum under the Smithsonian Institute is free, and this is one of the best things about being in D.C. The delegation, along with everyone else who passed through a museum door that day, came back moved by history, or knowing something they didn’t before. For example, the designer of Jackie Kennedy’s wedding dress was African American; many Native Americans joined every war the US participated in in the 20th century and specific languages of theirs were used as code to send messages; and historically, women were not taken seriously as artists so could only be painters by profession as portrait artists for wealthy members of society. Education is available on almost every corner of D.C., and it instills a desire in one to leave the city with more understanding of the world than what they came with. If I can speak for the delegation, I would say this has occurred during our time here. After the day of Museum sights, flea market shopping, and questionable polo shirt purchases, the delegation began to gather their things together as time had crept up, leaving only one and a half days left in the Capital. Monday morning welcomed the delegation to crisp winds and a chance encounter/15 seconds of fame for one delegate with a Canadian news reporter outside the White House on our way to the World Bank to meet with Peter Kyle, former lead counsel. This meeting with Peter Kyle at the World Bank was highly anticipated, and not just because one co-director had repeatedly stated the World Bank cafeteria was going to be her highlight of the trip. The meeting with Peter Kyle did not disappoint. The delegation had a very informative discussion with him regarding his life and his incredible career both in New Zealand and overseas with the Asian Development Bank and then with the World Bank. Even for those on the delegation who were not as clued up on international economics as others, Peter’s ability to tell stories and explain challenges and successes he had through his career came through clearly. With Peter Kyle at the World Bank. One of the most notable experiences Peter shared with the group was when he talked of his time travelling to Eastern Europe after the fall of the USSR to move them from a communist led economy to a market order. He was on the team that was tasked to create Russia’s private sector and assist with foreign investment and trade. Peter also offered some advice based on his own personal experiences, and encouraged the delegation to be involved in everything attainable to us in this day and age, and not to be a spectator of life. 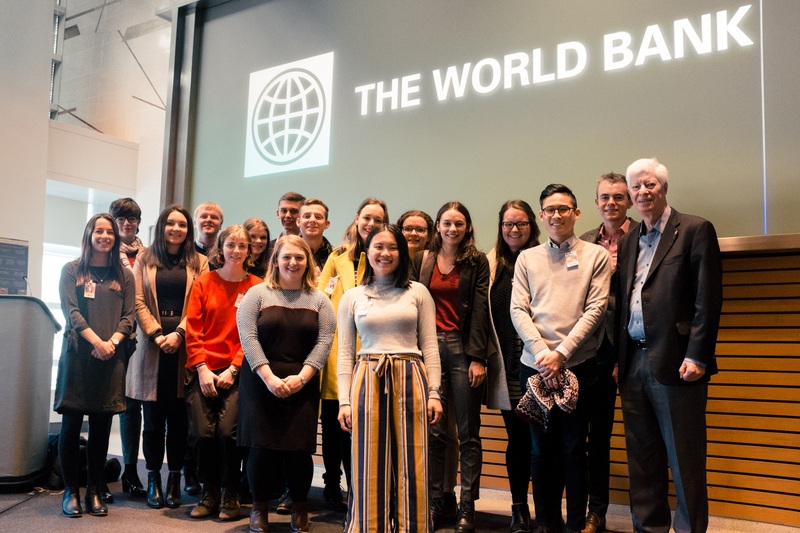 After the meeting, Peter led the delegation on a small tour of some of the offices and impressive board rooms the World Bank offered, before leading us down to the eagerly anticipated cafeteria. To say the delegation was overwhelmed would be an understatement. The cafeteria offered very affordable food from a range of countries from Malaysia to Latin America. On a glance at the room amidst the bustling World Bank members various delegates could be seen in situations just as hilarious as the next. Some couldn’t decide what to eat and therefore ended up walking in circles around the room, some found themselves too caught up in the bustle and panic-joined a cue, and some were so overcome with choice they simply stood in the room, mouth agape at all that was on offer in front of them. When we all sat down to eat, no one was disappointed with their choice, and we all left the World Bank feeling satisfied in the knowledge we had gained and the food we had devoured. We next travelled to Georgetown where the delegation spread out over the stores, some seeking out coffee and others posting postcards at the oldest Post Office in America. We then made our way to the picturesque Georgetown University, with one delegate describing it as an American Hogwarts. The campus and its buildings left many delegates wishing they could transfer over for a semester or two. We met at the Intercultural Center where Dr Alan Tidwell was waiting to greet us in an easy to spot New Zealand Aotearoa Cap he sported just for us. With Dr Alan Tidwell outside the Intercultural Center at Georgetown University. Dr Alan Tidwell is the director of the Australian, New Zealand and Pacific Studies Center in Georgetown’s School of Foreign Service. The Center is one of two universities in America to offer an undergraduate certificate in New Zealand studies. Dr Tidwell was incredibly generous not only with his time and his answers that he gave to our questions but also with the cookies he left out for us. It was invaluable to talk to Dr Tidwell who offered us the chance to see New Zealand taught from an outside perspective. Dr Tidwell clearly knew our country well and held it in high regard, speaking of the role he saw New Zealand hold in the international arena and what he hoped students of his would come away with after taking the course. It was especially interesting to speak on where he believed bilateral relations between New Zealand and America were heading as America moves into a new administration. That night, our last night in D.C., half the delegation set out to the Verizon Center to watch the local basketball team the Washington D.C. Wizards beat the Oklahoma City Thunder. We were treated to the full live American sporting experience – live hand-on-heart national anthem singers, organ countdown sounds, half time shows and t-shirt tosses into the crowd. The rest of the delegation remained back at the hostel, packing their bags ready to take on our last day in Washington D.C.
Washington D.C. Wizards vs Oklahoma City Thunder at the Verizon Center. Our third full day in Washington DC was a busy one indeed. We started the day with a meeting at the Centre for Strategic and International Studies (CSIS), a DC-based think tank. There we met Ben Contreras, Program Manager for the CSIS Southeast Asia Program and a UN Youth alum, as well as Shannon Hayden, Associate Director and Geoff Hartman, Fellow. The meeting at CSIS was dynamic, and Shannon, Jeff and Ben provided some great answers to our questions about the role of think tanks, government funding, and some of their past policy initiatives. Our meeting at Center for Strategic and International Studies. After the meeting, we had some free time to explore the local neighbourhood of Dupont Circle. Some took the opportunity to add to their business wardrobes before we head to HNMUN, while others grabbed lunch at nearby restaurants. Later in the afternoon we all met up again for our second meeting for the day, at Human Rights Watch (HRW). There we met with Mary Wareham, who is the Advocacy Director of the Arms Division and a fellow Kiwi. We had a very frank and fascinating talk that covered topics such as her work towards banning cluster ammunitions (particularly their use in Syria and Yemen), her educational background and what led her to work in the field of human rights. We also discussed HRW’s campaign to ban fully-automated weapons (Campaign to Stop Killer Robots) and how HRW and its partners lobby states for change in international law around this issue. 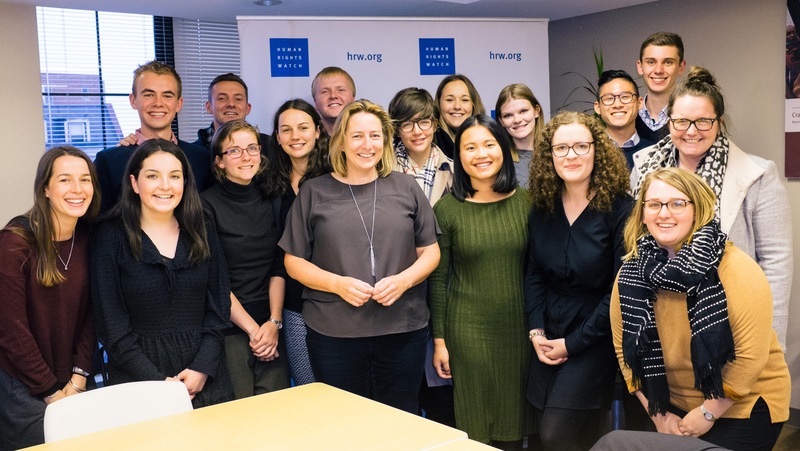 Our meeting with Mary Wareham at Human Rights Watch. A great way to end the week. After the meeting, most of the delegation filled in time in nearby op-shops before our delegation dinner, held at the Old Ebbitt Grill, famous for being where political players pack into the brass and wood interior. The delegation was served such food as burgers, crab cakes, salmon salad and roasted butternut squash. It was a great time to catch up with one another and enjoy some great quality food. We were lucky enough to be joined by Ben Contreras from CSIS for our meal. After dinner, we returned to the hostel for a chance to relax and get some proper sleep. Saturday was our fourth day in DC, and we started it with a tour of the Capitol Building. The tour was great; our guide kept it light and funny, while we walked around the historic building. We then went to the “best coffee shop in Washington DC” to meet up with Dr Chris Mahony, a New Zealander who works for the UNDP and for the World Bank’s Independent Evaluation Group to review transitional justice processes and systematic country diagnostic reports respectively. Chris shared parts of his life story, gave us valuable career advice, and was honest in sharing his views about the challenges and successes he has faced in his past and current lines of work. Inside the Capitol Building’s rotunda. After lunch at a delicious local sandwich shop recommended by Chris, we ended the day with several of the Smithsonian museums. Our group split up and went to the Air and Space Museum, the National Museum of African American History & Culture, the National Museum of Women in Arts, and the Museum of American History. Washington DC: Diplomacy, Defence, and Donald. Having survived flight delays and turbulence, we arrived in historic Washington DC ready to navigate diplomacy, defence and Donald. Waking up on Wednesday morning to weather warmer than Wellington, we set off to the highly anticipated meeting with our incredible New Zealand Embassy here in DC. We were lucky enough to meet with First Secretary James Waite, and Second Secretary Caroline Eszes, two very accomplished and interesting NZ experts! Both James and Caroline gave us insight into New Zealand diplomatic efforts in the country, US and NZ foreign relations as well as a look into the day to day proceedings of life as a diplomat. The delegation with Second Secretary Caroline Eszes outside the Embassy. Following a break for lunch, our first peek at historic monuments and stuffed unicorn shopping at Walmart, we headed in to meet Francisco Bencosme, a Legislative Aide to Senator Ben Cardin of the Senate Foreign Relations Committee. Francisco explained to us the inner workings of the committee and its relationship with its counterpart committee in the House of Representatives. 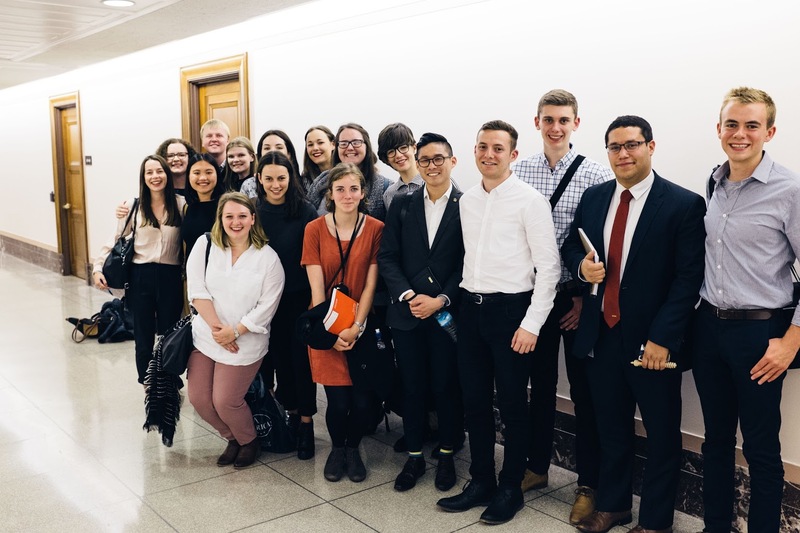 With the current political climate, the delegation was interested to hear Francisco’s thoughts on future foreign policy and the changing bipartisan relationship within both the committee and the Senate. The delegation was particularly excited to briefly meet the leader of the Committee, Republican Senator Bob Corker, however, some of the group’s hopes were dashed when a similar chance encounter with with Vermont Senator and America’s lovable grandpa Bernie Sanders did not arise. Taken moments before our chance encounter Senator Bob Corker! The afternoon was filled with the chance to visit the National Mall and to flood Instagram feeds with pictures of the Capitol, the Washington Monument, the White House and the Abraham Lincoln Memorial. 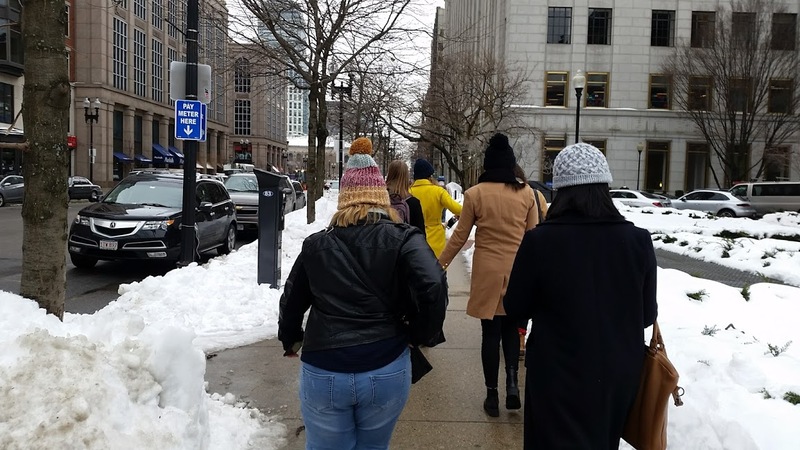 With the weather reaching its highest winter temperature in 117 years, the delegation were able to spend the time exploring the Mall, following in the footsteps of the millions of those who attended the most recent inauguration (or even more excitingly, those marching in the record breaking Women’s March!). 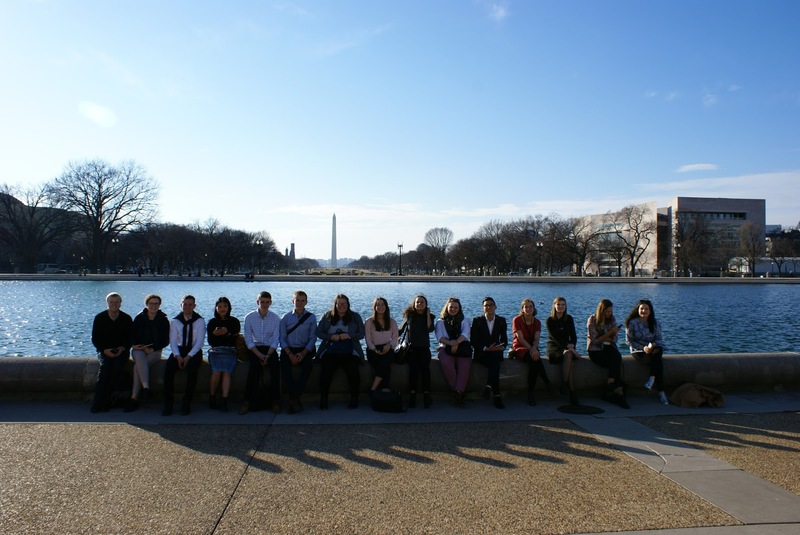 The opportunity to take in some of Washington’s historic sights was relished by the group, before finishing the all-American day with some old fashioned burgers and soda from a diner. Taking in historic sights, (unicorns not pictured). The delegation awoke to ice cold temperatures, and after rugging up, we headed off to catch the Metro to the US Pentagon. Arriving outside the impressive building, our first stop was at the Pentagon Memorial to the victims of the 9/11 attack on the building. Heading inside we were greeted by members of the Air Force Honour Guard, who lead us on the tour of the building. Lt Ryan provided us with fun facts and information surrounding the history of the US military, the Pentagon and notable servicemen and women including Dwight Eisenhower and John F. Kennedy. The afternoon saw the delegation visit the US State Department, the US equivalent of the New Zealand Ministry of Foreign affairs. Whilst we were unable to spot newly appointed Secretary of State, Rex Tillerson, we were fortunate to meet with three highly experienced staffers of the department; Andrew Hyde, the Director for Regional and Policy Coordination, Jenny Wright, the Pacific Islands Multilateral Officer and Gaeten Damberg-Ott, the New Zealand Desk Officer. We were able to gain insight into the US perspective of the relationship between the two countries and how recent policy changes have affected US standing on the international stage. The visit strengthened the delegation’s understanding of the bilateral relations that exist between NZ and the US, and policy areas in which the two collaborate and can continue to do so in the future. The delegation with our impressive speakers. The day ended with a spot of shopping through the central city, with some choosing to indulge in hot soup, while the braver of the group battled the elements (including a brief snowstorm) in pursuit of ice cream! Posted in US Leadership TourLeave a Comment on Washington DC: Diplomacy, Defence, and Donald.